Celebrityville! is a fancy-dress comedy cabaret and club-night based at Bethnal Green Workingmens Club centred around the horrific-terrific theme of celebrity. 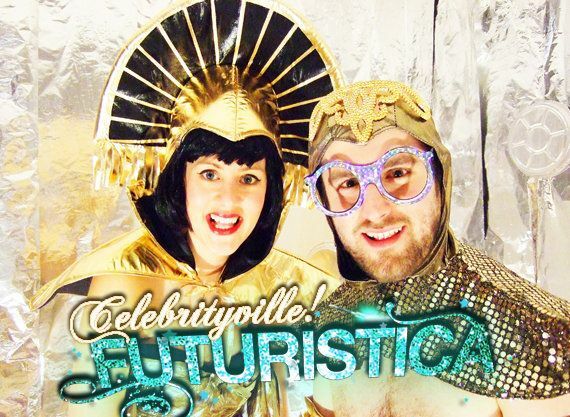 This months theme is 'Futuristica'. Oh Gosh darn it... our silly celebrity characters have gotten their talons on a time machine and are set to go hurtling buttock-first into the future. Expect Stripping Cyborgs, Eutopia Lessons, Poetry from Uranus and an Armegeddon sing-a-long! Silly sketches and twinkly vids for an hour or so, cheapo drinks all night AND THEN post show party with DJ's Player Player and L'Verge (Snap, Crackle and Pop and Fancy Footwerk) til late. PLUS plenty of cutting and sticking, 80's Aerobics, dressing up and party games to playâ¦ so if you want to catch the show, or just come to the after-party GET YOUR ROBO-BUTTS DOWN HERE!